About - Nutri-Ject Systems, Inc.
We are the leading biosolids professionals in the Upper Midwest. We specialize in removal and land application of solids from wastewater and water treatment facilities. Nutri-Ject Systems encourages the recycling of biosolids because of it’s rich nutrient value on agricultural land. Nutri-Ject Systems welcomes the opportunity to assist you in your lagoon, lake, or river siltation or biosolids buildup problems. We will provide FREE sludge judging and site studies for land utilization of biosolids and cost estimates. Through past experience we’ve found lagoon systems half full of biosolids in as little as 10 years operation. By dredging you can again realize the design detention time and capacity. You have the opportunity to utilize the latest in equipment and the experience it takes for the dredging of settling ponds, sewage lagoons, water plant lime sludge, and oxidation ponds. Our experience with both State and Federal agencies can be used to insure that all regulations are followed for the land application or dewatering of your biosolids/sludges. We provide low turbidity dredging so facilities can continue to operate during the dredging process. Our crews will gladly operate “round the clock” to speed up production at no extra cost. Nutri-Ject has a well maintained fleet of semi-trailer tankers for the hauling of your biosolids to field applicators or its final destination. 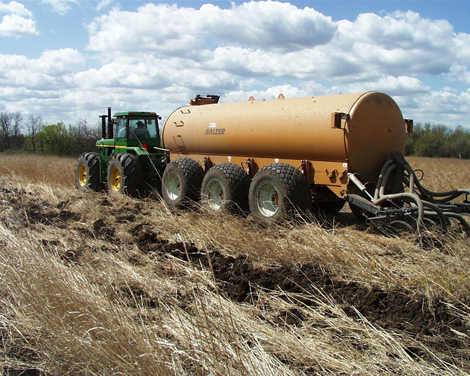 We utilize special high floatation vehicles designed to apply biosolids evenly and uniformly, whether on the surface or subsurface. At Nutri-Ject Systems, Inc. we strive to provide outrageous service to our customers by doing whatever it takes to get the job done in a timely and environmentally sound manner, while providing a safe and secure, stable future for the men and women we work with!